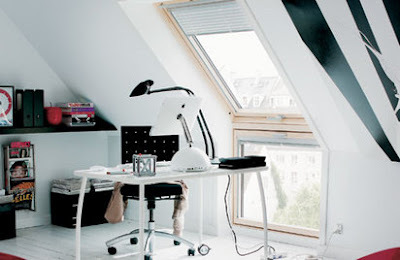 plus an attic space can get pretty warm, so ventilation is essential. Your choice will affect the look and feel of the room, as well as the cost and complexity of the project so it's crucial you get it right. What are the various different window types that you can choose from and how do they differ? Discreet, inexpensive and easy to install, the classic roof light is ideal for most loft conversions. There are several manufacturers around, although Velux is the most well-known. Internally, they won't add any space to your room, so they may not be the best option for attics with head clearance issues, but equally, they don't protrude from a roof's exterior, making them more suitable for spots where a dormer is not acceptable or practical. You can also pack in more roof lights, and a bank of two or four together can make for a pretty spectacular loft room, assuming you can get this past building control. As it is unlikely your window cleaner will be getting up onto the roof any time soon, some roof lights tilt in such a way that you can safely get to the exterior glass for cleaning from indoors. If your window is too high to be accessible (or you are idle in a particularly grandiose fashion), you can get roof lights that are operate electrically by remote control. These even have a sensor that closes the window when it rains and some have a special coating on the exterior of the glass to keep it clean. Many roof lights also have some kind of vent option. Generally speaking, there are three opening styles - pivoted (either from a central point or top third), side hung (like a casement window) or top hung. The pivoted type can be space saving as you don't need to keep the area around them clear of furniture for access. Side and top hung versions give you the advantage of only opening outwards, so work where low pitched roofs are a problem, and are great for giving you a big, open view out of the window. They also make very practical means of escape windows (see Building Regulations on the next page). As well as bringing light and ventilation, dormer windows add space to your loft and are very useful in giving you more head room. Typically, lofts have standing room only along the middle of the loft, leaving the edges for clutter and tiny furniture. As you need decent clearance around a staircase, this means that the stairs can only come up into the middle of the space, severely limiting your options. A dormer provides head clearance, which can allow for stairs at the side, or other useful features, like a shower. More than one dormer opens many windows of opportunity, but local planning controls may restrict you to a dormer at the back of the house only. Because the window part of the dormer is flat at the front, you can have a standard window installed to complement those in the rest of the house, or if space (and planning) allows, French windows. Where dormer windows project out from the roof, they affect the look of the exterior of your property, and are more likely to cause problems with neighbours feeling overlooked. Any advantages to gaining an extra room indoors could be negated by a horrible dormer making your home look ugly from the street, so pay attention to the size and design. Flat-roofed dormers are best suited to more modern properties, are cheaper and easier to install and provide more extra space in the loft. Pitched-roof 'chocolate box' dormers often sit more comfortably, like they have always been part of the house, particularly on older properties, but come at a price and don't add so much space.